Inspired by a true crime story. 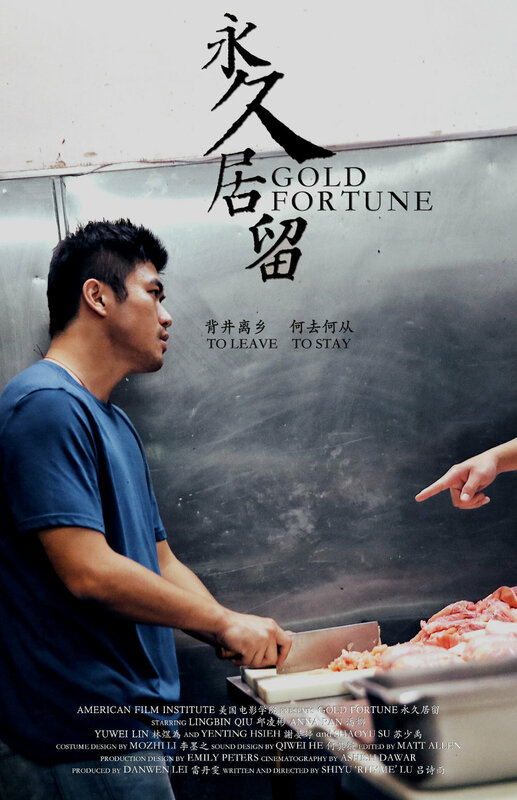 A 25-year-old Chinese young man, YUZHONG has been working in various Chinese restaurant kitchens since he illegally entered United States in the hope of a better life. As he moves to Los Angeles to seek legal identity through asylum fraud, he meets and falls in love with a waitress at his cousin’s restaurant. When YUZHONG receives a phone call from his asylum lawyer that he missed his court hearing, where would the tide of fortune take him to? Directing fellow at American Film Institute. He graduated from Brown University in 2013 with a BS in Applied Math and Economics. However, he has been preparing for a filmmaking career since sophomore year. After graduation, Rhyme has worked on four Chinese feature films as assistant director. He was fortunate enough to have collaborated with and learned from great Chinese directors such as Ho-cheung Pang, Jeffrey Lau and Stanley Kwan. Feature productions honed his execution and communication skills. Rhyme also directed many commercial videos, enhancing his directing and creative skills. Producing fellow at American Film Institute. She received a Fine Art degree from Beijing Film Academy in China, accomplished multiple short films in different positions including editor, VFX producer and director. Her graduation project WHERE THE DREAM BEGINS was a finalist for Outstanding VFX in a Student Project at the 12th Annual Visual Effects Society Awards. She also worked on the 3D feature film THE MONKEY KING as VFX supervisor assistant. Before going to AFI, she did pre-production for multiple 3D large-format films in Beijing as a producer assistant. Cinematography fellow at American Film Institute. After shot and produced a variety of content in India for 6 years, he completed his MBA (Finance) from the illustrious "Sri Sathya Sai University" in 2005. He subsequently followed his passion to tell stories & create imagery. His first feature "Under the same sun" had a world premier at the Mill Valley Festival 2015 in San Francisco and won the silver audience choice award. Subsequently, He shot a language feature "Kandathai Sollugiren" for National Award winning director, B.Lenin. He also shot a documentary feature 'Jhatka' (2014) for Mr.Lenin. Editing fellow at American Film Institute. He is a graduate of Pepperdine University with a BA in Media Production. He served as office intern at CBS Films and provided support on the films THE DUFF, WHAT IF and PRIDE. While studying in London, Matt attended courses at the VET Post Production Facility in East London and received his Avid Media Composer User Certification. He interned with the Weinstein Company at the 2014 and 2015 Cannes Film Festivals. Matt edited the independent feature film MY FRIEND VIOLET that will be released next year. At the world-renowned AFI Conservatory, a dedicated group of working professionals from the film and television communities serve as mentors in nurturing the talents of tomorrow's storytellers. The Conservatory is consistently recognized as one of the world’s top film schools.